Petrology (from the Greek πέτρος, pétros, "rock" and λόγος, lógos, "subject matter", see -logy) is the branch of geology that studies rocks and the conditions under which they form. Petrology has three subdivisions: igneous, metamorphic, and sedimentary petrology. Igneous and metamorphic petrology are commonly taught together because they both contain heavy use of chemistry, chemical methods, and phase diagrams. Sedimentary petrology is, on the other hand, commonly taught together with stratigraphy because it deals with the processes that form sedimentary rock. Lithology was once approximately synonymous with petrography, but in current usage, lithology focuses on macroscopic hand-sample or outcrop-scale description of rocks while petrography is the speciality that deals with microscopic details. In the petroleum industry, lithology, or more specifically mud logging, is the graphic representation of geological formations being drilled through, and drawn on a log called a mud log. As the cuttings are circulated out of the borehole they are sampled, examined (typically under a 10× microscope) and tested chemically when needed. ^ Frost, B. R.; Frost, C. D. (2014). Essentials of Igneous and Metamorphic Petrology. Cambridge University Press. Best, Myron G. (2002), Igneous and Metamorphic Petrology (Blackwell Publishing) ISBN 1-4051-0588-7. Blatt, Harvey; Tracy, Robert J.; Owens, Brent (2005), Petrology: igneous, sedimentary, and metamorphic (W. H. Freeman) ISBN 978-0-7167-3743-8. Fei, Yingwei; Bertka, Constance M.; Mysen, Bjorn O. (eds.) (1999), Mantle Petrology: field observations and high-pressure experimentation (Houston TX: Geochemical Society) ISBN 0-941809-05-6. 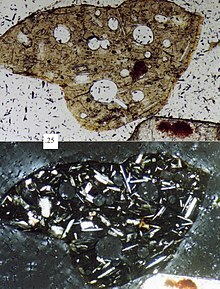 Wikimedia Commons has media related to Petrology.